The dholak is a South Asian two-headed hand-drum.It may have traditional cotton rope lacing, screw-turnbuckle tensioning or both combined: in the first case steel rings are used for tuning or pegs are twisted inside the laces.The dholak is mainly a folk instrument, lacking the exact tuning and playing techniques of the tabla or the pakhawaj. 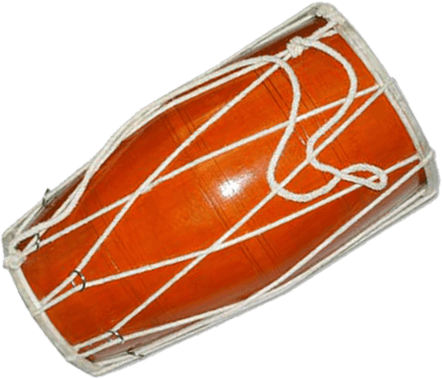 The drum is pitched, depending on size, with an interval of perhaps a perfect fourth or perfect fifth between the two heads.It is related to the larger Punjabi dhol and the smaller dholki. The dholki (Hindi/Urdu: pipe or tube) is often a bit narrower in diameter and uses tabla-style syahi masala on its treble skin. This instrument is also known as the naal. Its treble skin is stitched onto an iron ring, similarly to East Asian Janggu or Shime-daiko drums, which tenses the head before it is fitted.